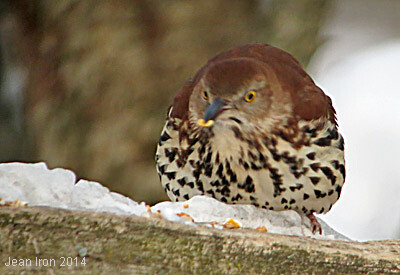 It's unusual for a Brown Thrasher to overwinter in Ontario, but this one is surviving one of the coldest Ontario winters in recent years. It has been at Lynde Shores Conservation Area in Whitby since early January. 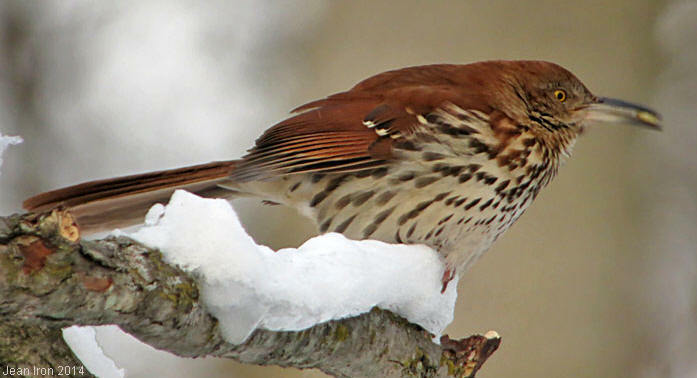 What is this Brown Thrasher eating when the ground is frozen hard and covered with snow and ice, and the main diet of Brown Thrashers consists of beetles, worms, caterpillars, grasshoppers, wild fruit and acorns? Lynde Shores on 3 February 2014. I thought it must be eating berries at Lynde Shores, but no, it's eating birdseed. 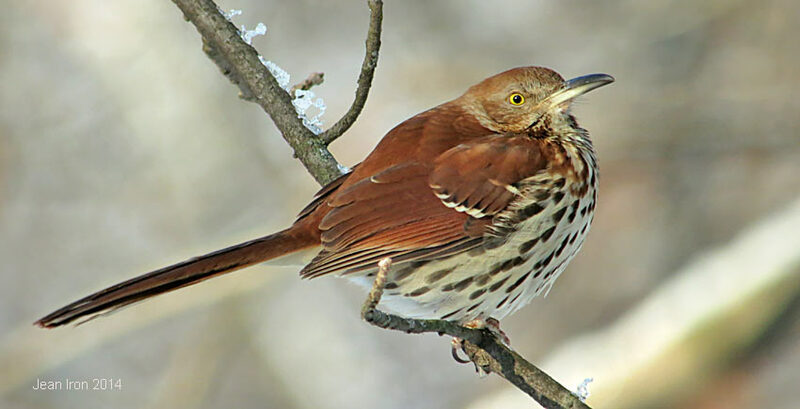 A check of The Birds of North America on-line showed that seeds and grains, especially corn, made up about 40% of a Brown Thrasher's diet in April in an Illinois study. Eating cracked corn at Lynde Shores on 8 February 2014. It also eats peanuts, sunflower seeds and finch seed. 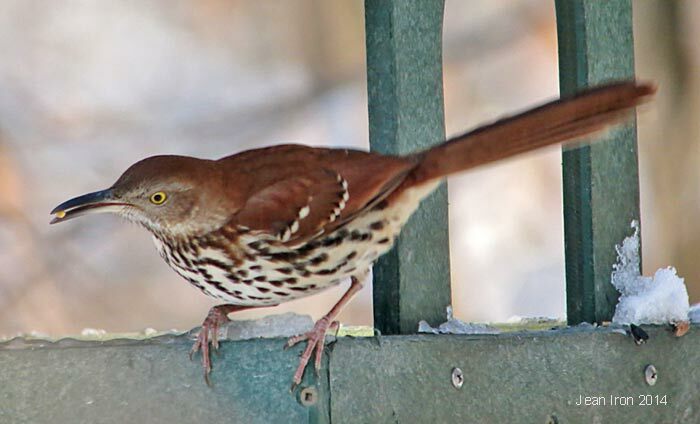 Brown Thrashers are an early returning spring migrant to Ontario, often seen in the first week of April at Beamer Hawkwatch and soon after on the Carden Alvar. At Beamer, we've watched them sweeping their beaks back and forth in the snow and leaf litter searching for beetles, grubs, worms and other invertebrates. 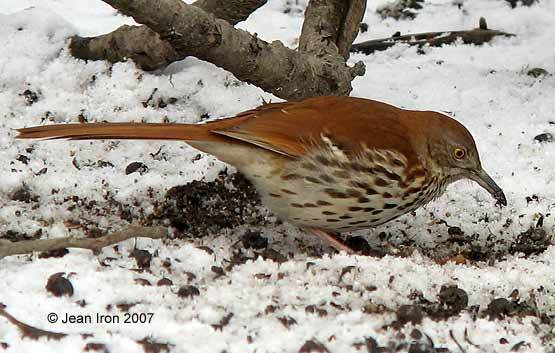 Please see link to Brown Thrasher at Beamer Hawkwatch on 8 April 2007.